Last post I wrote about extending the Django Admin interface by adding a little dynamic data to the help_text field. For more advanced things you need to customize the html widget itself. One thing I want to do is have a Django model automatically get a Google Map of the address I have stored and save this file. For my purposes though I don’t want this to be automatic, I’d rather an admin user check the map first then decide to overwrite any previous map file. I’ll extend the a widget to get this effect. First I need a preview box. I want to insert some extra html, I’m actually going to put this into a checkbox form, you will see why later. I need to override the render def on the widget to add some code. 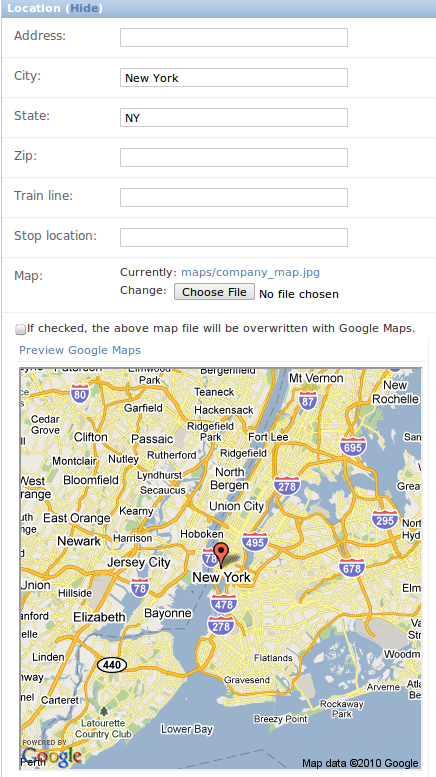 When the user checks off the box, Django will know to get that image and set it to the map ImageField. I do this by overriding the save function on my model. I use urllib to “wget” the file. This process will replace the previous practice of manually looking up maps, saving them, and uploading them. Of course if I trusted Google maps (or my addresses to be correct) I could just have it dynamically get that image when needed instead of storing the image file. This is most interesting. So basically the user/admin can point on the map and get the desired marker position manually, so to speak, and then commit to the db? Do you have the possibility to save the coordinates as well? Yes, I guess this should be combined with something like django-easy-maps. The problem with the latter is that google maps is not able to find an address in about 50% of the cases. Your widget would be great in those cases, to “manually” pinpoint the exact location.